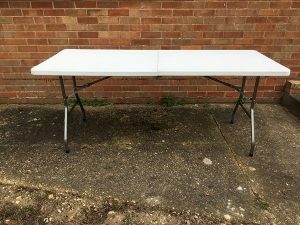 Strong White Plastic Folding Table, Metal Legs. 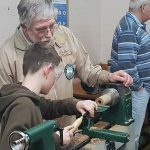 A new Record Power Stand and Wheel Kit Assembly brought with a BS300 Band Saw, but not needed so donated to the Club. 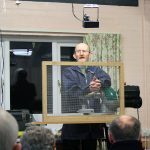 Could be used to fit to any other piece of machinery you have in your workshop that you need to be easily moved around. The top measures 14″ x 19.5″. It has been disassembled to fit into a box, full assembly instructions will be provided.